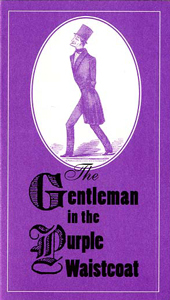 The American Antiquarian Society has put up a piece about the upcoming book The Gentleman in the Purple Waistcoat, an investigation into the murder in 1849 of Dr. George Parkman. Before the development of CSI-emulated forensics, it took only six months to decide Harvard Professor John W. Webster did it, should be arrested, and would die by hanging. The “vignette” written by the AAS is really interesting reading. The book is apparently going to introduce plenty of reasonable doubt about the guilt of Professor Webster.